Although fairly old, Alien Breed is still an excellent arcade blast-'em-up and an undoubted classic. Compared to its sequel it perhaps isn't as sophisticated byt despite this it doesn't appear as dated as you might think. Viewed from a top down perspective, you take on an alien army who have infested a Federation research station. Based in the future, you are positioned in a galaxy on the brink of war, and with the aid of various weapons it becomes your role to blast the aliens and complete the missions. 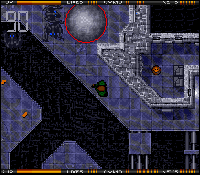 Alien Breed is a highly atmospheric game and the tension created works well as the action becomes more and more frantic, with aliens appearing out of nowhere which you need to destroy. 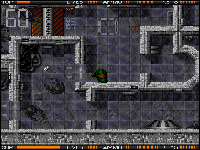 Good graphics contribute to the atmosphere considerably, with settings such as dingy corridors and space terminals. The added small details make highly realistic backgrounds and create a futuristic feeling. The eerie music also conjures up a great deal of the atmosphere. Other sound effects, such as gunshots and aliens yelphing when hit, work well, and sampled speech has been used to generate realism. Extra features have been added to this new edition, such as new missions and bigger levels, so newcomers to the game and Alien Breed veterans alike will find the game a challenge. The two-player mode also adds an extra dimension to the gameplay. This is blasting mayhem at its best, and it's well worth a look if you didn't catch this excellent title first time round. Classic arcade platform action completes this double act in the form of Qwak, a highly playable title whose sprite is a duck. The game could be accused of being a Bubble Bobble clone but this does not detract in any way from its quality. And although platformers these days hardly have a reputation for originality, this one stands out for its totally absorbing gameplay. The aim is relatively simple. Clear the screen of baddies, collect bonuses and grab the keys to open the doors to the next level. Life is made more difficult with the inclusion of dissolving platforms, time limits and all manner of strange enemies to hinder you. Firing eggs at the enemies will eliminate them; points are awarded for successfully doing so, and after each of the eight worlds you'll face one of the tough end-of-level guardians. The game contains a two-player feature which works well in providing variety, and the puzzle angle also adds another element guaranteeing longevity. Graphicss are colourful and complement the overall fun feeling of the game. This is also picked up in the accompanying tune which is in keeping with the lively gameplay. The controls are well designed and make the game instantly playable. Qwak, although not exactly intellectually demanding, will provide hours of fun gameplay and a good laugh along the way as well. If aliens didn't breed they'be pretty think on the ground. Unfortunately, these ones have taken it upon themselves to inhabit a spacecraft. Armed with a machine gun your task is to stop the aliens breeding ("But we wre only necking"). And if you like, you can take a friend along with you to help out. As top-down shoot-em-ups go, they rarely come better than this and as you rush along corridors exterminating the courting fiends, picking up credits and keys, you can only be thankful that this mission has befallen you. Best in two-player mode. Doctors have never figured highly in platform games. And Qwak is no different, instead plumping for a duck. Nice duck though. A total of 80 levels, end of level guardians, eggstra screens (oeuf!) and a host of baddies play a large part in Qwak. It's ridiculously cute, colourful and playable but don't let that put you off. You despatch the baddies with eggs and although it isn't the most innovative of fare, it's darned fun. And it looks a bit like Bubble Bobble, which certainly isn't a bad thing. Best of all, there is a simultaneous two-player mode so after calling a halt to the alien business you can pretend to be a duck and collect daises with a pal. Hurrah! An odd couple, but excellent value for just a pony. Der zweite CD-Sampler von Team 17 weiß da schon besser zu gefallen, zumal die betagte Labyrinth-Action der "Special Edition" nach wie vor spannendes Gameplay für bis zu zwei Alien-Jäger garantiert - wenn in den Extra-haltigen Futuro-Irrgärten die Laser sprechen, stimmt der Spielspaß auch ohne neue Gimmicks. Und beim ehemaligen Budgetprodukt "Quak" handelt es sich um ein unauffälliges, aber enorm spielbares Jump & Run mit bunter Knuddelgrafik, das gleichfalls für Laune sorgt. Bei beide Spielen wurden die Ladepausen verkürzt und die Steuerung optimiert, die Optik wirkt hingegen mittlerweile schon etwas angestaubt. Es wäre also mehr drin gewesen, doch für 73 Prozent reicht's auch so noch. The first of Team 17's budget-price double-packs weighs in with the supercute Bubble Bobble-esque platformer Qwak (AP31, 88%) and the seminal Gauntlet clone Alien Breed (just in case you were in danger of confusing the two), in a bizarre but effective pairing of game styles. Alien Breed is atmospheric and scary (if a little uneventful in parts), and Qwak is bright, jolly, fast-paced, action-packed, and uses 'up' to sodding well jump. For God's sake, I'm so annoyed I can't write any more. No, really I can't. Absolutely not. No way. Smart compilation (if that's not too strong a word), but offers no advantage over bying both the floppy versions on budget and having a fever left over for crisps.